The key to understanding Earth’s evolution is to look at how heat is conducted in the deep lower mantle—a region some 400 to 1,800 miles (660 to 2,900 kilometers) below the surface. 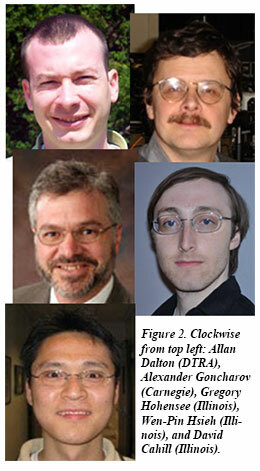 A research group including former CDAC post-doctoral associate Allen Dalton (now at Defense Threat Reduction Agency), Carnegie-CDAC Scientist Alexander Goncharov, CDAC Partner David Cahill (Illinois), and CDAC Students Gregory Hohensee and Wen-Pin Hsieh, have for the first time experimentally simulated the pressure conditions in this region and measured thermal conductivity. They used a new technique that was developed by the team and applied it to a model mantle material magnesium oxide (MgO). The team found that heat transfer is lower than other predictions, with total heat flow across the Earth of about 10.4 terawatts, which is about 60 % of the power used today by civilization. They also found that conductivity has less dependence on pressure conditions than predicted. 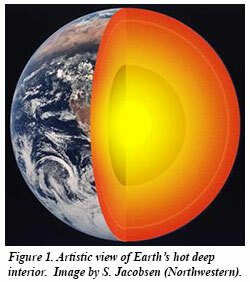 The lower mantle sits on top of the core where pressures range from 230,000 to 1.3 million times the pressure at sea level. Temperatures are like an inferno—from perhaps 2,800°F to 6,700 °F. The major constituents are oxides of magnesium, silicon and calcium. Heat transfer occurs at a higher rate across materials of high thermal conductivity than across materials of low thermal conductivity, thus these low thermal conductivity oxides are insulating. The atoms of the major mantle materials are solid solutions and are in a disordered arrangement, which affects the way they conduct heat. Until now, the effect of this disorder on the way heat was conducted could only be estimated with experiments at low pressures. The pressure dependence on thermal conductivity has not been addressed in disordered materials before. The researchers squeezed the samples between two diamond tips in an anvil cell and measured the thermal conductivity of the samples, debuting a technique called time-domain thermoreflectance. They went up to 600,000 times atmospheric pressure at room temperature, allowing them to measure the thermal properties of the material from the change in the reflectance of the material’s surface, thus avoiding the need of contacting the material of interest as required by conventional techniques. They then compared the results to theoretical models. They also showed that there is less dependence of thermal conductivity on pressure than had been predicted. Calculations showed that at the core-mantle boundary there is an estimated total heat flow of 10.4 terawatts across the Earth. The results provide important bounds on the degree to which heat is transferred by convection as opposed to conduction in the lower mantle. The next step will be to examine effects of different mineral components on the thermal conductivity and to better understand the atomic scale basis of convective motion of these materials within the broader context of mantle dynamics. The results suggest that this technique could really advance other high pressure and temperature studies of the deep Earth and provide a better understanding of how Earth is evolving and how materials act under the intense conditions [D. A. Dalton et al, Sci. Reports 3, 2400 (2013)].